Whispers in the Loggia: Killed On Mission: An Oblate "Saint"
As the Stateside crowd pauses today to remember our civil fallen, it's worth recalling that the church's own continue to give their lives as they serve in harm's way, too. In that light, long known for "taking risks" to aid those in need, Oblate of Mary Immaculate Fr Larry Rosebaugh was shot and killed in a carjacking last week in Guatemala, where he lived and worked with the poor for the better part of three decades. A veteran activist for peace and the marginalized, the 74 year-old Wisconsin native dubbed "Lorenzo" recently received permission to return to the States, where he planned to work the fields in his boyhood home of St Louis. 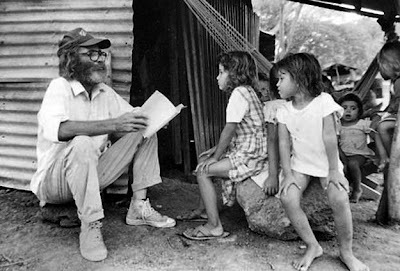 Rosebaugh lived through two civil wars, and most of his days were marked by the violence of the Latin America slums where he worked, ate and slept. And yet his life was dedicated to nonviolence and peace. For those who loved Rosebaugh, that made the end of his life all the more poignant. "Lorenzo's violent and unexpected death has given us another saint," said the Rev. Vicente Louwagie, the Oblates' provincial superior in Mexico. At Rosebaugh's funeral Wednesday, in a suburb of Guatemala City, Louwagie described the priest as "a mix between St. John the Baptist and St. Francis of Assisi," according to Catholic News Service, "from his smile, his eyes, to his unforgettable flowing white beard." Bob Graf, a friend from Milwaukee, had known Rosebaugh since the 1960s. "He was a very simple, humble person, and he radiated a gentleness and kindness," Graf said. Details of the murder were vague — a roadside robbery gone awry, or possibly a failed carjacking. An official at the U.S. Embassy in Guatemala City said she could not comment. Various English-language news reports said gunmen opened fire on Rosebaugh — who was driving — and four other Oblates on Monday evening as they drove to a meeting about 300 miles north of the capital. The men stole the equivalent of $125, a cell phone and some religious ornaments. A Guatemalan newspaper, Prensa Libre, reported that the masked gunmen fired when the priests refused their command to stop, killing Rosebaugh and wounding a Congolese Oblate, the Rev. Jean Claude Nowama. Linking Rosebaugh's murder to his political advocacy for the poor came naturally for those who knew the skinny, soft-spoken, bespectacled man, who sported thrift-store clothes and a huge, bushy white beard, and whose life thoroughly blended the political and the holy. "He was driven by his desire to be with the poor," said Mary Lou Pedersen, a friend from Chicago. "That's where he wanted to be and that's where he went." Among tributes to Rosebaugh came one from his Oblate confrere and seminary classmate, now Cardinal Francis George of Chicago. The murdered priest's work "was not just philanthropy," the USCCB chief told the St Louis Post-Dispatch. "He was a voice for Christ among the poor." "A Shameful Catalogue of Cruelty"